Candlestick patterns are a great decision support tool for active traders. Bullish and bearish engulfings have an ideal mix of reliability and frequency that makes them a powerful addition to any trader’s repertoire. They can be very helpful for predicting reversals when used in conjunction with other forms of technical analysis. Let’s take a look at how to find and trade engulfings, as well as some real-life examples of how to use them. 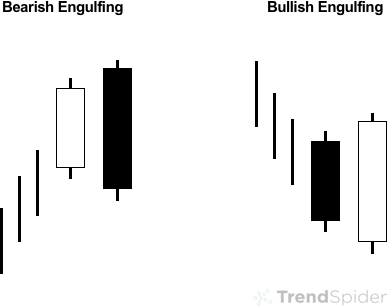 Bullish and bearish engulfing patterns are candlestick patterns that are commonly used to predict a reversal. The are formed when the candlestick direction changes, but the open and close of the second candlestick is higher and lower than the open and close of the first candlestick. This suggests that a massive shift took place in the direction of the trend. According to Bulkowski, bullish engulfings successfully predict a reversal 63 percent of the time while bearish engulfings predict a reversal 79 percent of the time. This means that traders may want to assign more weight to bearish engulfings compared to bullish engulfings — or at least look for stronger confirmation in bullish engulfings. Let’s take a look at the two types of engulfings. Bullish engulfings occur when a bearish candlestick’s real body is completely engulfed by the real body of a subsequent bullish candlestick. In other words, the second bullish candlestick had an open and close that was higher and lower than the previous period’s open and close. Some traders also look for shadows, or wicks, that are completely engulfed by the second candlestick. Bearish engulfings occur when a bullish candlestick’s real body is completely engulfed by the real body of a second bearish candlestick. In other words, the second bearish candlestick had an open and close that was higher and lower than the previous period’s open and close. Again, some traders look for added confirmation in the form of engulfed shadows. Bullish and bearish engulfings are fairly reliable candlestick patterns on their own, but most traders still seek confirmation before entering a trade. For example, you might look for an engulfing pattern in combination with a trend line breakout or breakdown. You may also look for the engulfing pattern to occur on higher than average volume that could mean a more robust reversal. It’s also important to consider the prevailing trend. Bullish engulfings work best when they occur at the bottom of a downtrend and bearish engulfings work best when they occur at the top of an uptrend. Engulfings that occur in choppy sideways trading may not provide as strong of a signal. You might also look for engulfings in longer timeframes and then dig into shorter timeframes to pinpoint entry and exit points. By taking this approach, you can increase the odds of a successful trade while minimizing your time in the market by focusing on specific entry and exit points. The price target for most engulfing patterns depends on other technical factors. For example, a bearish engulfing that occurs following an extended uptrend could have a price target that’s set using a Fibonacci level or by looking at trend line resistance levels on the way down. Let’s take a look at a real-life example of engulfings to see how they work in practice. The following chart shows a series of engulfings that were automatically identified on the S&P 500 SPDR ETF (NYSE ARCA: SPY) chart using TrendSpider. The first series of engulfings occurred during a choppy, sideways market, so those could be safely ignored by traders. The latest bullish engulfing occurred as the stock moved toward trend line support. 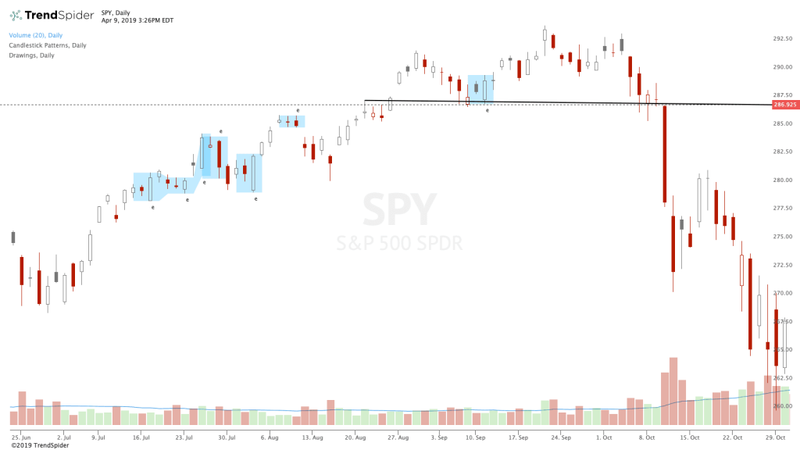 The ETF continued to move higher following the engulfing to briefly surpass its prior highs, creating an opportunity for significant short-term gains. Bullish and bearish engulfings are fairly reliable candlestick patterns that are commonly used to predict a reversal. While they shouldn’t be used on their own, they have an ideal mix of frequency and reliability that makes them a powerful addition to any trader’s repertoire. Sign up for a free trial to see how TrendSpider can help you automatically identify engulfings on any chart!